I saw a French movie called Immortal. It was one of those films shot entirely in "digital backlot", where the actors were all shot in front of blue- and green-screens with all the backgrounds added in post-production. It takes place in New York one hundred years in the future. Some kind of giant pyramid has materialized out of thin air and floats above the city. There are practically are no physical sets in any real sense of the word. 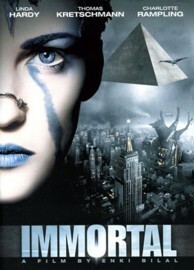 Unlike other movies in the past, Immortal goes one step further by using digitized human actors as well as real life ones. You get to see some cool views of a future world, however these glimpses are simply just there and are never really explained. It's an ok film, very pretty as well. Immortal will show you where Sci-fi/Fantasy film making is going as the art of digital backlot gets better.